We offer a variety if artistically handcrafted incense holders made from 100% recycled aluminum. The radiance of these fully polished aluminum products reflects simplicity and elegance in design. 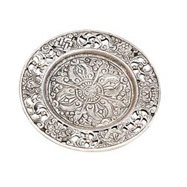 Some of these items are delicately embossed on both sides using traditional Tibetan designs to create a unique and intricate look.